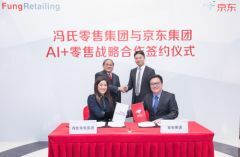 BEIJING, Feb 2, 2018 - (Media OutReach) - Fung Retailing Limited, with a network of over 3,000 stores, and JD.com (Nasdaq: JD, JD.com or JD.COM), China's largest retailer, today announced a partnership to develop AI-driven retail solutions. According to the agreement signed today, the two companies will cooperate in using AI to transform the retail landscape, and to collaborate in areas including AI platform development and the application of AI to smart retail. The agreement calls for the establishment of an AI Boundaryless Retail Center that will oversee and manage cooperative research and development projects, and facilitate the sharing of information and expertise relating to AI technology. Leveraging AI, and combining JD.com's extensive online expertise and Fung Retailing's offline expertise, the two companies aim to develop a new retail format for China and Asia. This includes creating an AI-driven retail system that seamlessly integrates online and offline retail platforms; developing an end-to-end system that enables the management of products, pricing, storage, order and payment; and enhancing consumer experience through solutions such as AI-driven virtual fitting, unmanned stores and smart shopping assistants. Speaking at the signing, Sabrina Fung, Group Managing Director of Fung Retailing Limited said, "When it comes to the future of retail, and driving the customer experience, AI is an essential component. Across our retail portfolio, AI is a focal point and this co-operation with JD will, without doubt, accelerate our progress." Bowen Zhou, Vice President of JD.com and Head of JD's AI Platform and Research said, "As one of the largest retailers in the world, we believe that figuring out how to deploy AI solutions is critical to our future success. Drawing on Fung Retailing's global offline retail expertise, this partnership will be important for us as we deliver our retail vision." The retailing businesses of the Fung Group are brought together under privately-held Fung Retailing Limited and extend from Greater China to the UK, France, Korea, Singapore, Malaysia, Thailand, and the Philippines through a combined network of over 3,000 stores. Focused on the Asian consumer and authentic heritage brands they include stores operated separately and independently by publicly-listed Convenience Retail Asia Limited (SEHK: 00831) and Trinity Limited (SEHK: 00891), as well as the privately-held Branded Lifestyle Holdings Limited, Fung Kids (Holdings) Limited, Toys "R" Us (Asia) Limited, Suhyang Networks Company Limited and UCCAL Fashion Group. Fung Retailing employs over 18,000 staff across a portfolio small, mid and large box size formats in the categories of men, women, children and food. Its turnover exceeds US$1.8 billion. The Fung Group (www.funggroup.com) is a Hong Kong-headquartered multinational group whose core businesses are engaged in trading, logistics, distribution and traditional and digital retailing. (Back Left) Victor Fung, Group Chairman of the Fung Group; (Front Left) Sabrina Fung, Group Managing Director of Fung Retailing Limited; (Back Right) Richard Liu, Chairman and CEO of JD.com and (Front right) Dr. Bowen Zhou, Vice President of JD.com and Head of JD's AI Platform and Research attended the AI+ retail strategy cooperation signing ceremony today.